I’m on record as being firmly in the sunsets are better in winter camp. And while I’m not backing down from that claim, I cannot deny that when all the pieces come together for a summer sunset the results are damn near impossible to beat. 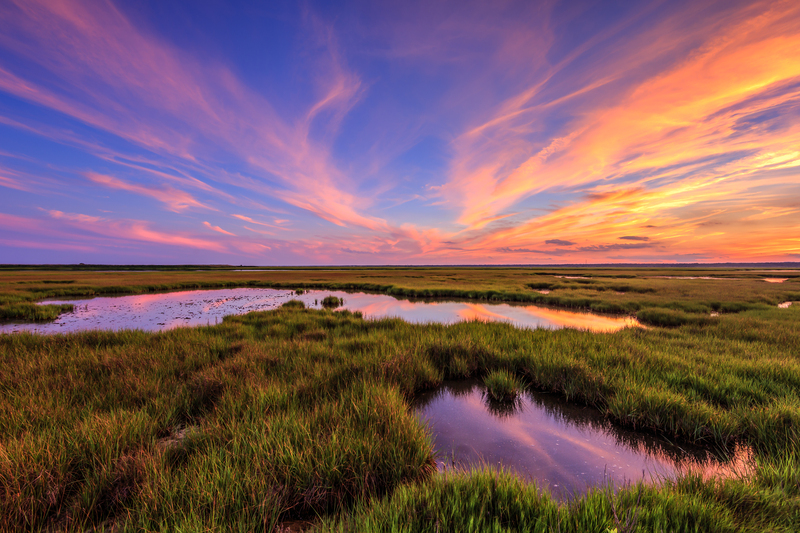 After all, one thing you will not get here in the mid-Atlantic come winter time is lush green marsh grass to compliment a sublime sunset—no matter how vivid the sky lights up. The best you can hope for is some quality ice flows, or some other appealing foreground to mask the unmistakable look of the great browning. Last night I was hemming and hawing about whether to shoot; I’m sure glad the manifestation of motivation won out. What initially looked like a decent to slightly above average sunset steadily ascended the sunset potential charts. Cirrus clouds built in across the sky, and some 20 minutes before sunset I knew I was standing at the doorstep of a good one. Come on in, nature was calling. Of course the green heads were calling to, but I did my best to avoid the sharp bite of our most fierce winged foe. A few well timed hand slaps went a long way, too. Sorry, not sorry, flies. Before long the great sun disk dipped below the horizon and the pastels began to build. Pink and purple hues first began stretching from east to west steadily arcing over the sky; they were well met by orange and yellow hues pulsing to the west were only minutes before the sun went down. About 10 minutes after official sundown this colorful cascade merged in perfect harmony backed by azure blue skies. What a scene. My best sunset capture since May.